On November 8, 2011, Russia launched a mission to the larger moon of Mars (Phobos). Its purpose was to land there, take a soil sample, and bring it back to Earth. This was a mission that my son and I had been anxiously awaiting for many years. But the rocket failed to leave its initial parking orbit around Earth, and it now threatens to crash into Earth with ten tons of toxic unsymmetrical dimethylhydrazine and nitrogen tetroxide and radioactive cobalt-57. On November 27 Russian President Medvevdev threatened prison for those responsible. Given the rich history of Phobos tales, I immediately suspected sabotage. On the matrix below, the axis term the sole ELS of MARS PHOBOS. A word for SABOTAGE at skip +1 can be seen with it in the 168 letters highlighted with a light purple background. Perhaps related, the Russian space agency, Roscosmos, and "a number of positions of responsible persons" could face jail time. The full 408-letter matrix also includesTO A ROCKET at the same absolute skip as MARS PHOBOS, but in the opposite direction. FROM A RUSSIAN is at an ELS, and the a-posteriori open text phrase IN A JOURNEY AFAR OF crosses MARS PHOBOS. STATISTICAL SIGNIFICANCE OF THE MATRIX. As per my standard protocol, no statistical significance is assigned to the axis term, here MARS PHOBOS in wrapped Torah. The primary key word was SABOTAGE at skip +1. It was in the 168 letters highlighted in purple against odds of about 454 to 1. On the full 408-letter matrix these odds are adjusted to 187 to 1, but we pick up two other a-priori terms. ROCKET (3 letter spelling) was at a special case skip against odds of about 20 to 1. No extra value is awarded for the letter lamed that turns the 4 letters colored in blue toTO A ROCKET. FROM A RUSSIAN is shown, but the actual a-priori word sought was just RUSSIAN. It was there against odds of about 4 to 1. No statistical value is assigned to the a-posteriori open text phrase IN A JOURNEY AFAR OF that crosses MARS PHOBOS. Overall odds against finding a matrix this significant: about 17,752 to 1. REAL SIGNFICANCE OF THE MATRIX AND THE FAILED MARS MISSION. The Russians have long suffered from a horrendous Mars probe record. There have long been rumors, and even odds statements by Russian officials about what happened to their last attempt to visit the largest moon of Mars, Phobos. The weirdest remark was by American lunar astronaut Buzz Aldrin, who claimed (during a C-SPAN interview) that there is a monolith on Phobos. As can be seen from the chart below, the Russians have had two previous unsuccessful missions to Phobos, although some photos were transmitted on their last mission before the probe was lost. Coverage from the Washington Post about their newest failure is posted after the chart. One effect of the Russian failures is that they have not provided any data that can be used to back NASA/JPL assertions about low Martian air pressure, or my own assertions that NASA/JPL is wrong. My son and I can, however, point to recent findings about water vapor on Mars by the European Space Agency that are more consistant with our findings than NASA/JPL findings. There are critical problems with Mars Science Laboratory (MSL) Curiosity and its pressure sensor (identical to one used on Phoenix). These will be discussed further below. The magnitude of the loss of Phobos Grunt is even greater if Dr. Robert Zubrin's assertions are correct. He claims that after the MSL Curiosity is launched, and the MAVEN orbiter scheduled for 2013 is sent up, that will be it. No further missions to anywhere are planned. Any investigation into the cause of the loss of Phobos Grunt should not overlook the possibility of sabotage by agents with a possible motivation of keeping an accurate picture of Mars from public view. The New York Times reported that, "An unnamed person in Russia's space industry told the Interfax news agency that there had been warnings before the launching that glitches in the probe's command and control system had not been fully resolved." There is, every two years, extra pressure to launch missions to Mars when the planet is best positioned for a mission. This pressure could have contributed to the failure. I am afraid that it also contribute to NASA launching the Mars Science Laboratory on November 26, 2011, despite the fact that it has what is likely to be a faulty pressure sensor. On August 6, 2011, my son and I have delivered the evidence for this concern into the hands of Dr. Ashwin Vasavada, the MSL Deputy Project Scientist. I later called Dr. Vasavada to discuss the finding. He indicated that he understood the concerns about the Vaisala Pressure Transducer delivered to JPL back in 2008 for this mission. But I have no indication that anyone acted on the evidence presented implying that all pressure sensors sent to Mars jammed with dust on landing, and therefore sent us wrong information about Martian air pressure. Mission Launch Date Landing Date Termination Date Result Weather/Pressure Data? Figure below: Laputa, as described in GULLIVERS'S TRAVELS by Jonathan Swift. The 4.5 mile diameter flying island with an adamantine base, can maneuver using magnetic levitation. Its educated population are fond of mathematics, astronomy, music and technology. They discovered 2 moons of Mars (which in reality would not be discovered for another 150 years). The possibility of Martian moons had been speculated long before their discovery by Asaph Hall in 1877. The astronomer Johannes Kepler (1571–1630) even predicted their number correctly, although with faulty logic: he wrote that since Jupiter had four known moons and Earth had one, it was only natural that Mars should have two. Perhaps inspired by Kepler (and quoting Kepler's third law), Jonathan Swift's satire Gulliver's Travels (1726) refers to two moons in Part 3, Chapter 3 (the "Voyage to Laputa"), in which the astronomers of Laputa (a round, metallic flying island that sounds a lot like a flying saucer) are described as having discovered two satellites of Mars orbiting at distances of 3 and 5 Martian diameters, and periods of 10 and 21.5 hours, respectively. The current orbital distances and periods of Phobos and Deimos of 1.4 and 3.5 Martian diameters, and 7.6 and 30.3 hours, respectively. The orbital periods are roughly similar to those guessed by Swift, but the radii were too big by about a factor of two. Voltaire's 1750 short story Micromégas, about an alien visitor to Earth, also refers to two moons of Mars. Voltaire was presumably influenced by Swift. In recognition of these 'predictions', two craters on Deimos are named Swift and Voltaire. It should be noted that Gulliver’s Travels portrays weaknesses of humanity in way that is reminiscent of what an might perceive. People are shown to go to war over foolish divisions in ideology (which end of an egg to crack first), to be cruel to animals by caging them for fun, as people do with animals in zoos or birds in cages, and to be less environmentally sensitive than animals. Indeed, when we consider joining of an alien-like observation of our species with a fairly accurate description of the moons of Mars 150 years before we had a telescope big enough to see them, we cannot overlook the possibility that Swift drew on a close encounter with extraterrestrials as the real inspiration for his marvelous novel. Modern speculation about Phobos is based upon the manner in which the Soviet Phobos 2 was lost, photographs of questionable significance, and alarming statements by Soviet officials and, of course, the remarks by Buzz Aldrin. There have also long been claims that Phobos is hollow. Mapping by the Mars Express probe and subsequent volume calculations do suggest the presence of voids within the moon and indicate that it is not a solid chunk of rock but a porous body instead. The porosity of Phobos was calculated to be 30% ± 5%, or a quarter to a third of the moon being hollow. This void space is supposedly mostly on small scales (millimeters to ~1-m), between individual grains and boulders. However, if so much space is empty, there may, of course, be larger voids that could prove useful for intelligent purposes. One thing is sure; the Russians have now focused three times on Phobos with their Mars missions. Perhaps they think they will find the real inspiration for the writings of Swift and Voltaire there. But with U.S. funding for Mars missions in jeopardy, there may have already been a decision made to ensure that we never arrive at the answer. If this is true, given the low salaries of technicians working in the Russian space program, it’s ever so easy to do what the matrix suggests – sabotage any effort to successfully put a rocket on the surface of the Martian moon. Phobos-Grunt, the latest in a long list of failed space endeavors by the Russians, is pictured here burning up as it reenters the atmosphere (artist's impression). Some recent Russian satellite failures may have been the result of sabotage by foreign forces, Russia's space chief said Tuesday, in comments apparently aimed at the United States. Roscosmos chief Vladimir Popovkin stopped short of accusing any specific country of disabling Russian satellites, but in an interview in the daily Izvestia he said some Russian craft had suffered "unexplained" malfunctions while flying over another side of the globe beyond the reach of his nation's tracking facilities. Popovkin spoke when asked about the failure of the $170-million unmanned Phobos-Ground probe, which was to explore one of Mars' two moons, Phobos, but became stranded while orbiting Earth after its Nov. 9 launch. Engineers in Russia and the European Space Agency have failed to propel the spacecraft toward Mars, and it is expected to fall back to Earth around Jan. 15. Roscosmos spokesman Alexei Kuznetsov refused to elaborate on Popovkin's comments, which marked the first time a senior Russian government official has claimed that foreign sabotage has been used to disable one of the country's satellites. "I wouldn't like to accuse anyone, but today there exists powerful means to influence spacecraft, and their use can't be excluded," he said. "It's a feature of space launch trajectories that orbital adjustments must be made halfway around the first orbit to circularize and stabilize subsequent orbits," Oberg said in e-mailed comments. "The Russians must know that simple geography -- not evildoers lurking in shadows -- dictate where their communications 'blind spots' are. But the urge to shift blame seems strong," he said. The failed Phobos mission was the latest in a series of recent Russian launch failures that have raised concerns about the condition of the country's space industries and raised pressure on Popovkin. Space officials have blamed the failures on obsolete equipment and an aging work force. A retired Russian general alleged last November that the Phobos-Ground satellite might have been incapacitated by a powerful U.S. radar. Nikolai Rodionov, who previously was in charge of Russia's early warning system, was quoted as saying that a powerful electromagnetic impulse generated by U.S. radar in Alaska might have affected the probe's control system. Popovkin said experts have so far failed to determine why the Phobos-Ground probe's engines failed to fire, but admitted the program had suffered from funding shortages that led to some "risky technological solutions." The spacecraft was supposed to collect soil samples on Phobos and fly them back to Earth in one of the most challenging unmanned interplanetary missions ever. It was Russia's first foray beyond the Earth orbit since a botched 1996 robotic mission to Mars, which failed when the probe crashed shortly after the launch due to an engine failure. Scientists had hoped that studies of Phobos' surface could help solve the mystery of its origin and shed more light on the genesis of the solar system. Some believe the crater-dented moon is an asteroid captured by Mars' gravity, while others think it's a piece of debris from when Mars collided with another celestial object. Earlier Coverage: Toxic Russian Mars Probe Likely Heading Back to Earth. By Ian O'Neill (Published November 12, 2011 in Discovery News). The original article was edited for the sake of brevity on my web site. Scientists grew excited last week as Russia's planned its first interplanetary mission in 15 years. By now, the ambitious mission should be powering through space, toward the Martian moon Phobos. Instead, Russia's space agency spent Friday discussing uncontrolled reentry scenarios. Authorities may be looking for someone to blame after a lengthy string of mission failures. According to an Interfax bulletin, an anonymous source indicated that this may force reform in the Russian space agency, Roscosmos, and "a number of positions of responsible persons" could face jail time. This could be an uncontrolled toxic reentry scenario. Phobos-Grunt is fully laden with unsymmetrical dimethylhydrazine and nitrogen tetroxide; that's ten tons of fuel and oxidizer. The probe itself weighs in at only three tons. Most of the fuel will likely vaporize during reentry, but everyone will be hoping for a splash-down in an ocean as the wreckage will still be hazardous. There's also a small quantity of radioactive cobalt-57 in one of the science mission housed in the probe. It is for these reasons that the Russian media is dubbing Phobos-Grunt "the most toxic falling satellite ever." Friday's efforts are widely regarded as a last-ditch attempt to salvage the mission. Other space agencies such as NASA and ESA have offered to assist, but the probe is quickly becoming unrecoverable. Since Phobos-Grunt was placed in low-Earth orbit (LEO) on Tuesday, and the probe successfully separated from its booster rocket, its attached cruise stage rocket has yet to light up, providing a critical two burns to blast the probe away from Earth to begin its planned 10-month journey to the Red Planet. It is unknown whether there's a software error or hardware glitch, but attempts to upload new commands to the onboard computers have so far failed to change the situation. Phobos-Grunt's batteries are draining and its orbit is degrading. It looks as if the probe will reenter later this month/early December. NORAD is reportedly putting a Nov. 26 reentry date on Phobos-Grunt... The probe's orbit takes it between the latitudes 51.4 degrees North to 51.4 degrees South -- most of the world's population lives within that zone, and Phobos-Grunt could come down anywhere. Despite the fact that pieces of the probe will hit the ground, it is still extremely unlikely it will cause death and destruction. The demise of Phobos-Grunt will be a huge loss to the scientific community. Not only was the mission designed to land and scoop up some regolith (dust and rock) from Phobos' surface, returning it to Earth for analysis, it is also carrying a fascinating $500,000 Planetary U.S.) Society experiment called the Living Interplanetary Flight Experiment, or "LIFE." LIFE is composed of many different types of bacteria to small organisms that seem to tolerate the space environment pretty well. Why send microscopic organisms to a Martian moon? In an effort to understand how life appeared on Earth, the experiment would have put the hypothesis of "panspermia" to the test. Panspermia is a proposed mechanism by which life may "hop" from one planetary body to the next -- meteorites slamming into Mars, say, ejecting many tons of debris into space. Should any organisms be "hitching a ride" on the debris, could they (or at least their genetic information) survive the interplanetary journey, and atmospheric entry, to spawn life on another world? The first Chinese Mars satellite, Yinghuo-1, was also hitching a ride and won't go any further than LEO either. There was another update on Phobos Grunt published on January 23, 2012. It claimed that U.S. tracking data for the failed mission was accidentally pulled from the web in unusual fashion. EXTRACT FROM HIGHER THAN ADVERTISED MARTIAN AIR PRESSURE The following report extract discusses the Vaisala/Finnish Meteorological Society (FMI) pressure sensor destined to fly on the Mars Science Laboratory Curiosity mission set to lift off in November, 2011. It is identical to the one used on the Phoenix Lander. We believe that like the pressure sensor (transucer) flown on the Viking and Pathfinder missions, it will clog with dust on landing and produce faulty pressure readings if the lander makes it as far as Mars. 2.3. Issues Raised by the FMI. In his e-mail of December 15, 2009, Kahanpää made clear that there was no extra filter. However, the confusion in his report highlights another possibility. As is shown in Figure 11A, the filter is very small (~10 mm2). Like the Tavis transducers that were used for Vikings and Pathfinder, the Vaisala transducer was exposed to a vacuum on the way from Earth to Mars. Again, when Phoenix landed, a lot of dust was raised by the retrorocket. The air pressure outside was supposed to be low, almost as low as outer space. The flow of air into the transducer therefore should not have been too fast. However, if the pressure outside was higher than expected, the rate of flow of air and dust into the Phoenix would be faster than planned for, with the result that dust would be rapidly sucked in just like a vacuum cleaner would inhale it. A tiny filter might well quickly clog with dust so fast (in a tiny fraction of a second) that it would prevent more air from reaching the pressure transducer (see Figures 11A and B below for dust filter sizes and location). With a clogged filter, pressure at the Barocap pressure sensor head would stay pegged at a low pressure reading. If there was a higher pressure on the outer side of the dust clog, it could not be felt on the inner side where the Barocap resided. This could explain the confusion by Kahanpää & Polkko and why they asked in their report about more filters being present. Even if the FMI team eventually received the needed information about relocation of heat sources, corrections to the pressure indicated at the Barocap pressure sensor head would not reflect what the true pressure was on the other side of the dust clog. One important difference between the Vikings and both Pathfinder and Phoenix is that the latter two landers did not include RTG heaters. Therefore, it would be expected that as the sun grew lower on the horizon and temperatures dropped, pressure would go down steadily. 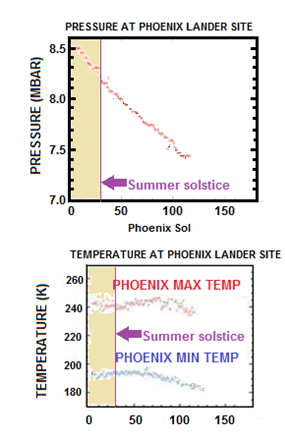 In looking at data for Phoenix derived from Nelli et al., 2009, this is what happened (see Figure 12). The pressure fell in a nearly linear fashion. With respect to Phoenix design, Kahanpää & Polkko repeatedly mentioned funding problems, although the meteorology package for Phoenix cost $37,000,000. Not only was an anemometer unfunded, but a way to change the dust filter was also left off the shopping list. Indeed it is unclear if anyone conducted tests to see to how much dust was required to clog the filters, or if such tests were conducted, what size dust particles, and what density of dust particles were involved. Kahanpää & Polkko (2009) stated that the Mars Science Laboratory (MSL), slated for launch in 2011, is a $2 billion cornerstone mission and is therefore handled in a different way than the $454 million dollar scout mission Phoenix. However, MSL’s FMI-built sensors (delivered back in 2008, see http://space.fmi.fi/solar.htm) were slated to be in the 0-11.5 mbar range – still too low. If they still do not account for dust filter clogging, the results can be expected to be similar to those questioned throughout this report. NASA needs a new approach.